Clore Automotive has been named NAPA Tools & Equipment 2018 Supplier of the Year. 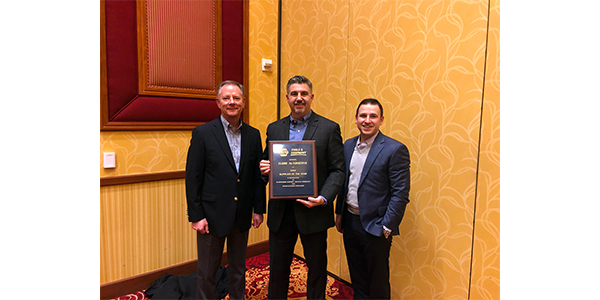 Dave Nicki, NAPA vice president of tools & equipment, presented the award at the 2019 NAPA T&E National Sales Meeting, Mountain/Western Region. Kirk Clore, vice president, sales and marketing, accepted the award on behalf of Clore Automotive. NAPA Tools & Equipment team members from throughout the U.S. nominated suppliers for the award, based on a wide range of selection criteria, including sales growth, quality, delivery, promotional development and commercial support. Clore Automotive designs, develops and manufactures automotive service equipment for professionals and consumers, including jump starters, battery chargers, battery testers, power inverters and LED lighting solutions.